- Temps started off in the high 40's but warmed up very fast as I hiked along the South Meadows Truck Trail to Marcy Damn. I prefer the hike along the truck trail for a couple of reasons; one it is mostly flat and smooth, and two, the trailhead has free parking! - I made good time to the Marcy Dam where I got my first glimpse of the damage Hurricane Irene did to the Dam and the lake. The bridge across the dam is gone, the damn itself has been compromised, and the lake has been drained and is now mud flats. - From the dam I took the Avalanche Pass Trail for about a mile before hooking onto the Lake Arnold to Feldspar Brook Trail which had easy to moderate grades and was in pretty good shape up until I turned off on the L. Morgan Porter Trail to start the ascent up to Mount Colden. - I was surprised at how easy of a hike it was up to the summit, unlike the trail up Mount Colden from Lake Colden the trail from Lake Arnold was never steep and went by fast as I first hiked up to a sub summit where the views where incredible before dropping down to a col and topping out on the summit of Colden. 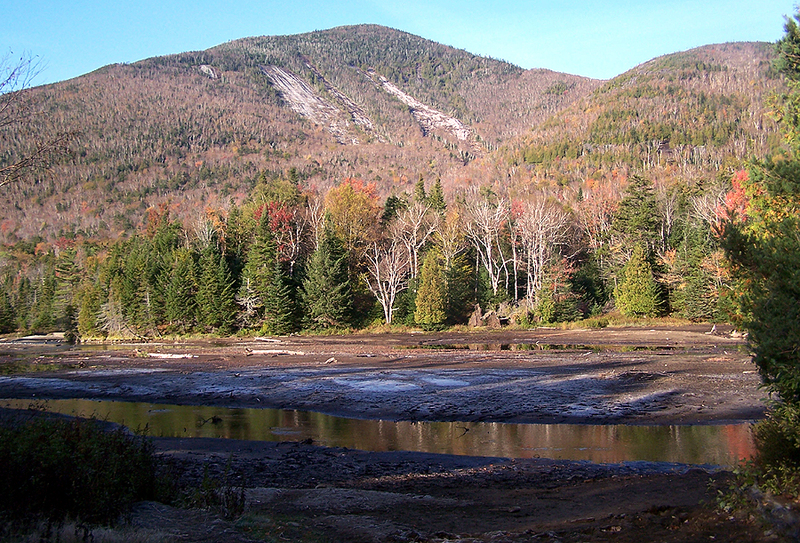 - The true summit is a pile of rocks off the side of the trail in the scrub as trail runs above the many slides of Mount Colden. Hurricane Irene created a new slide which runs into the famous Trap Dike (a huge gash in the middle of the mountain). From the trail you can see all the way down the slides which drop to Avalanche Lake and across the lake to the Hitch-Up Maltidas (bridges bolted into cliffs above the lake). Across the way Algonquin Peak rises high above along with Wright and Iroquois Peaks of the MacIntyre Range on each side of it. 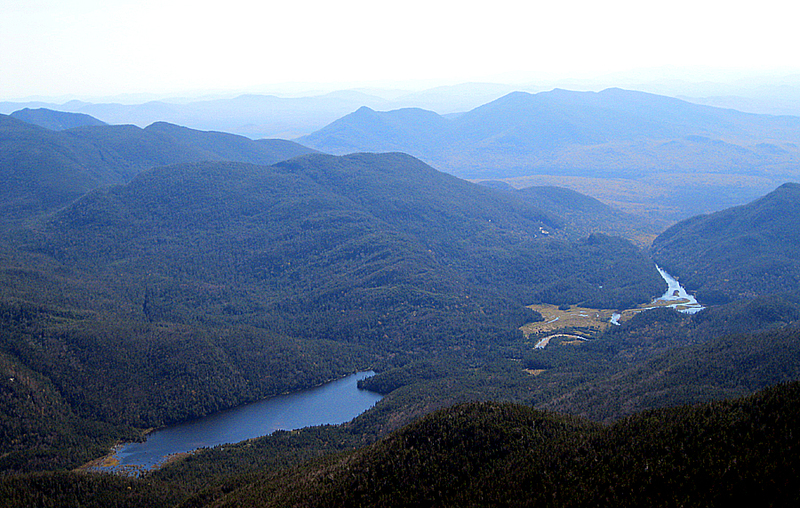 - I decided to descend the steep trail to Lake Colden, before dropping below treeline I had great views of Marcy, Gray, Redfield, Cliff, Skylight, down to Flowed Lands, and over to the MacIntyre, Santanoni, and Seward Ranges. - The hike down to Lake Colden was fast as the trail is relentlessly steep but luckily the warm temps melted any ice higher on the trail making it a little less tricky to navigate. It was still early enough that I figured why not head around Lake Colden and hike up to the summit of Algonquin Peak! - The trail up to Algonquin is a mirror image of the one that heads up from Lake Colden to Mount Colden, it's just as steep in places but easier below treeline because of less steep slab sections. 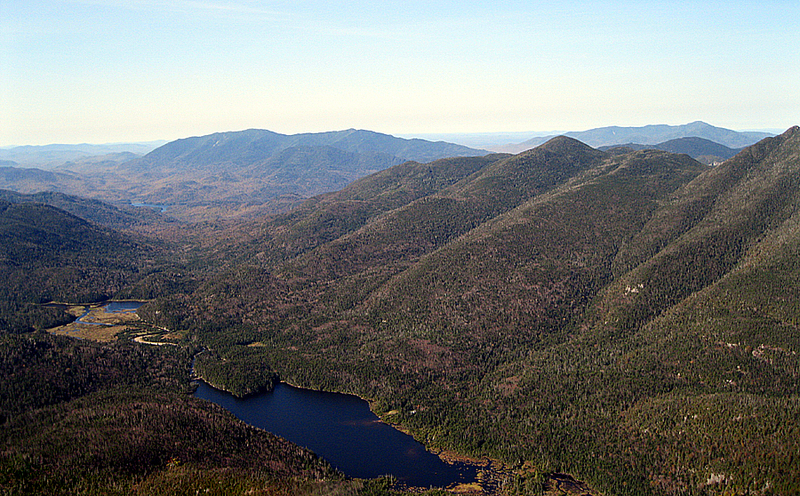 The views as you ascend the trail across to Mount Colden get better and better as you gain the ridge and pop up above treeline. 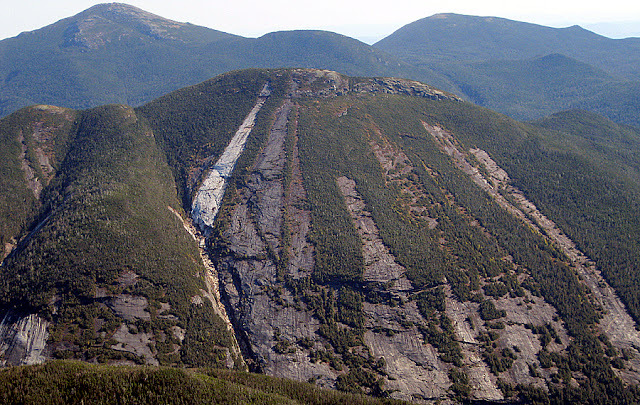 - The final half mile or so is up rock slab where views become phenomenal, especially of the slides and the Trap Dike below on Mount Colden. I was very interested to see what the new slide and the Trap Dike looked like since Hurricane Irene came through. The new slide is bright white and the Trap Dike has been cleaned out, all the small trees and plants are gone as the new slide rushed right through the dike and spilled into Avalanche Lake, pretty amazing stuff. - There were more that a dozen people on the summit enjoying the 360 degree views on a perfect fall day. I took a half hour break and took tons of pictures before heading back down to Lake Colden. 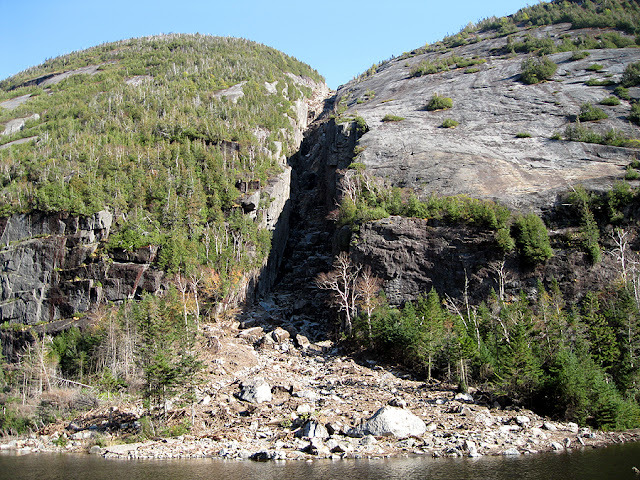 - The hike along the Avalanche Pass Trail was fun as I got to walk over the Hitch-Up Matildas and got a close up view of the bottom of the Trap Dike from across Avalanche Lake. 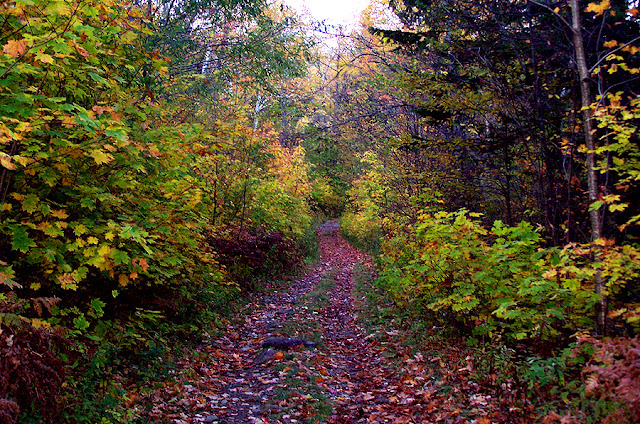 - The hike back to Marcy Damn and then to my car along South Meadows Truck Trail was fine but I was tired, luckily the truck trail is easy on the feet so it wasn't to bad after a long day of awesome hiking! Great Photos! I look forward to hiking it again as my previous trap dyke/slide hike was socked in with heavy clouds the entire way. Whats the point if you can't see the view? I agree! I'm going to be up there hiking this Saturday with some friends, it will be the first time up these trails for all of them and I'm hoping they get great weather to enjoy the views...if not I'll take them back again when it's a better day!